When you’re in your college years, there will be many events you’ll need to celebrate. Perhaps you want to have a celebration after the big step of orientation, commemorate new friends during the welcome week, or even honor your huge achievement after graduation. College is undoubtedly one of the most wonderful times during young adulthood where you’ll make friends that will be by your side for the rest of your life. Planning events to celebrate your achievements together is a great way to memorialize your time together with friends and family and make lasting memories. When you think about it, the average college student doesn’t have much free time. In between all of the stress of exams, homework, and internships, it’s likely that you won’t have much time to plan events to celebrate your achievements. So how can you celebrate without the stress? Hiring an event planner can help you have the time of your life without sacrificing the hours you spend on your studies! Event planners have made a career out of their experience in creating memories for clients seeking to memorialize an event. Contacting a college event planner will take the hassle out of your next celebration and allow you to make memories without stressing yourself out in the process! Once you have your party planner, they’ll take care of the rest with their knowledge and expertise in the field. 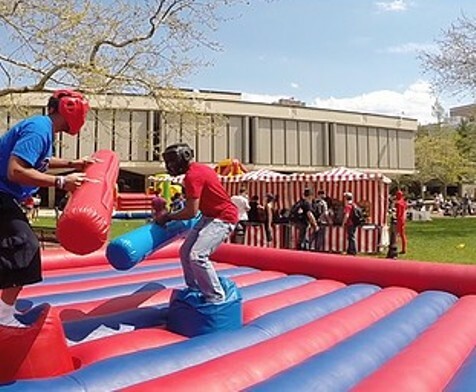 College events can include performers, black lights, carnival games, and fun inflatables that can all be organized and put together by an experienced planner who knows just how to create a wonderful celebration. For the more adventurous party-goer, dance parties, photo booths, and entertainers can be booked by an event planner to make the event a special night to remember. Skip the stress of booking and organizing and just sit back and celebrate your event! Whatever the type of party you desire, you can count on a college event planner to make it happen.